First things first. This is the greatest music video ever, which just happens to be Japanese. Note the three seconds from 1:19-1:22. So good. If you can’t see it below, the link is here. The first and last thirty seconds are filler from a TV show. Don’t let it bother you. 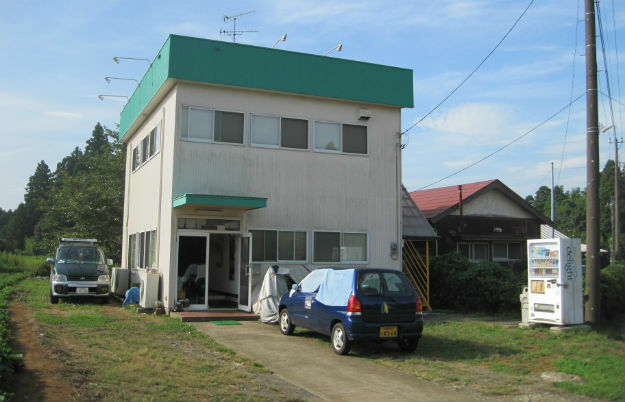 Yes, this is the Tokyo Narita Airport Hostel. Look at it. If this can be a successful hostel, anywhere can be. The vending machine is key additional revenue. The business plan is to keep it simple. All you need are the basics: a semi-clean place, a free shuttle, and hopefully near some food, which this isn’t—plus almighty wifi, of course. It’s not even that close to the airport at 8km (5 miles) away. The downsides are the heavy driving—the owner says he drives to the airport about five times a day—and you’d have to get used to everyone staying just one night. 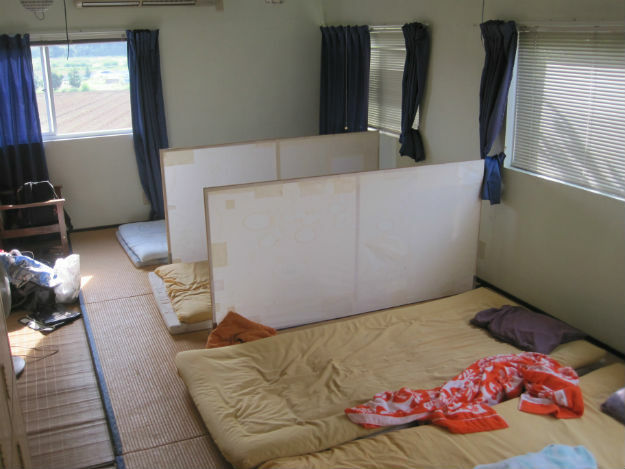 There are two rooms like this, $20 a night for a futon, which is cheap for Japan. It’s not as depressing as it looks. I mentioned the free wifi, right? Email is enya51@hotmail.com and this is the map. It’ll be about $2 less if you deal directly with Yama-san. What’s the big deal about saving $2? That’s 200 yen. THAT’S TWO PLATES OF SUSHI! THAT’S FOUR PIECES OF SUSHI!!! 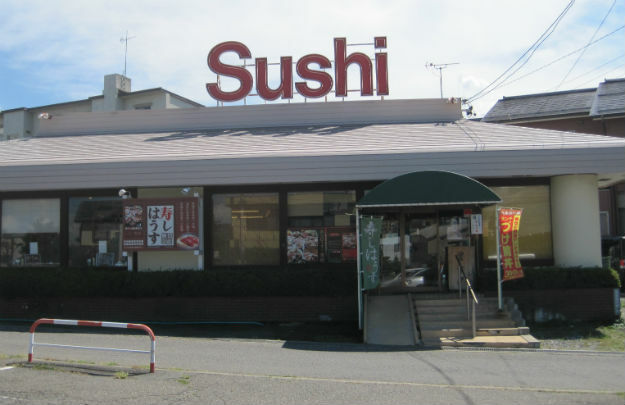 100 yen sushi places aren’t uncommon. 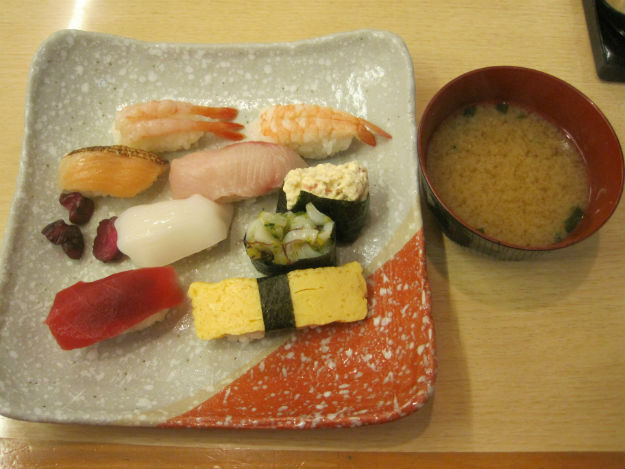 Even 90 yen sushi can be had. That’s why I was shaking and the photo came out blurry. I can’t figure out what they sell here. I need a bigger font! I hitchhiked, but, otherwise, the cheapest way to go from the airport to town is the Keisei Limited Express train that costs 1000 yen ($10). Don’t be swayed by the more expensive and luxurious Skyliners and fast direct trains when the good old Keisei train gets you there not much slower. Awesome video, but wait a sec, they all have black hair! How are they famous in Japan?! Maki doesn’t understand why you think this is the greatest music video ever. I find myself inclined to agree with her for just as long as she can see what I’m typing. Caleb, I don’t know how famous they are in Japan, actually. It’s hard to gauge these things. A tour de force or a tour de hormones? Nah, there’s nothing provocative about it, is there? Women can’t enjoy it, too? Come to Tokyo and you will see what short skirts look like. I can’t believe it myself. what the song and clip have to do with a article? The song has nothing to do with anything. You wouldn’t go out of your way and change places in the same town to save 30 bucks? cant wait to cuddle the white sheet of your bed,what u gonna do? Wonder around 8km or whatever to sleep at crappy hostel above,full of bedbugs probably,or you will just take a nearest free shuttle to the nearest hotel? 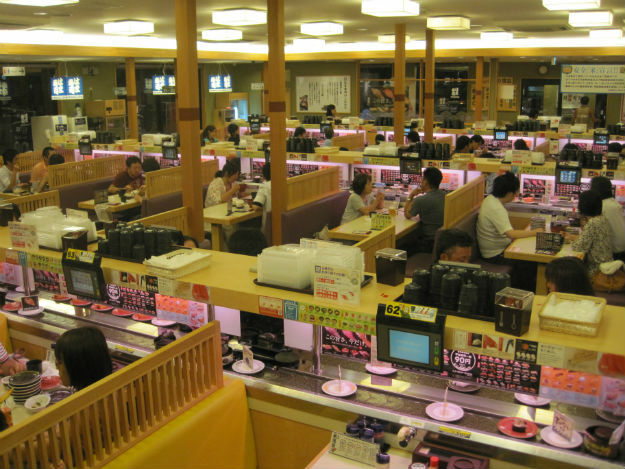 Many low cost,cheap backpackers like dont fly in to Narita anyway. Like I said i could be wrong but most if not many people wudnt bother with all this. And most of them dont stay in Narita for more then a day.If not for airport Narita would be unheard of ghost town.